Eind februari begon Mónica Machuca aan haar nieuwe job als Spaans lerares bij Local Dreamers. Nu ze haar eerste maand bij Local Dreamers achter de rug heeft, is het tijd om eens wat meer over deze vrolijke verschijning te weten te komen. Mónica stelt zich graag even aan jullie voor. My name is Mónica Machuca and I’m from Loja, a southern province in Ecuador. Because of the job of my father, we moved to the Amazon region in my childhood to live with the native people of that region for a year. Later I moved to Quito, where I now already live for many years. I’m an industrial psychologist and beside that I’m graduated in teaching Spanish as a second language, especially for foreign students. In my free time I like to do sports as hiking and swimming. Beside that I like to watch English movies and read books. The reason that I started working as a Spanish teacher was because I love to share my knowledge of Spanish with foreign people. I’m very happy that I can now use my pedagogic systems and combine them with the learning techniques you use when you teach a Spanish class. When I found the advertisement of Local Dreamers on internet my first reaction was ‘WOW’. I never knew that there was a Dutch organization located in the South of Quito. It’s not a common place for foreign people, you don’t see them a lot in the South. I always had the goal in my life to meet foreign people and to work in an international organization, so I decided to apply for the job. And so I started a new experience in my life. After my first month I feel very happy that I work at the foundation. I like my work more than I could ever imagine. The Dutch people are wonderful, they are very communicative and cooperative. They love to meet Ecuadorian people and try to integrate into the Ecuadorian culture. This foundation gives people in the poor neighborhoods a lot of opportunities. To learn English, play sports as football, swimming and hockey. Opportunities that are normally not affordable for the people in the South. Local Dreamers brings two different cultures together, that’s what I really like. As a Spanish teacher I also want to share my knowledge about Ecuador and the typical Ecuadorian dishes. I love to prepare dishes like Fanesca, Locro and guinee pig, what’s a traditional delicacy in the Andes region. Besides that I want to help the volunteers by learning the Spanish language. All so they can add more value to the volunteer projects of Local Dreamers. During my classes I like to teach the volunteers things about our culture. Of course we will practice grammar, listening, speaking and writing part of Spanish, but all while we’re talking about the integration of a volunteer in Ecuador. 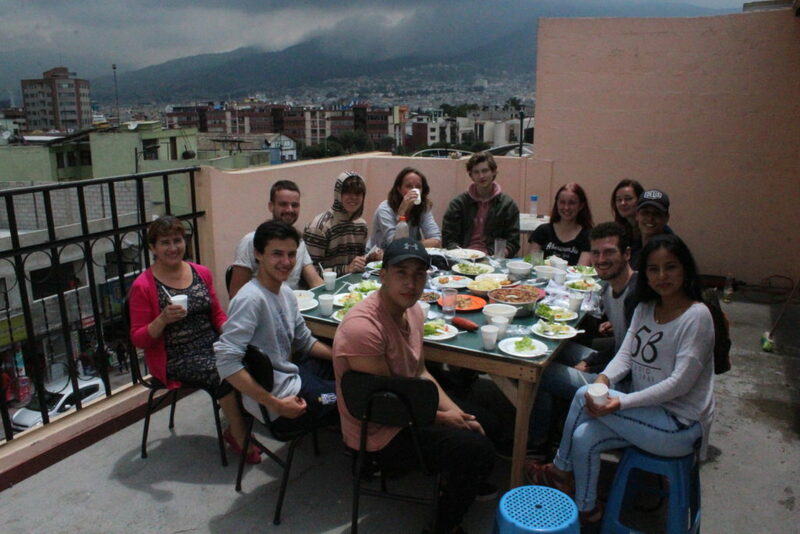 We talk about situations in which the volunteers will come during their life in Quito. And we discuss the things they ran into while living with their host family, working in the projects or things they hear in typical Latin songs. I’m looking forward meeting a lot of volunteers with different backgrounds at Local Dreamers. Since I already live in Quito for years I can really advice people to visit our city. Quito has a very special architecture and you can find a great mix of different cultures like the pre-incas, Incas and Spanish culture. Quito is located between the beautiful mountains, has a lot of museums in the old town, indigenous markets and a more western part in the new town. Beside all the nice places that Quito has, Ecuador is also very easy to travel. In a couple of hours from Quito you can already visit beautiful nature. I hope to see you all soon! Afgelopen week bereidde Spaans lerares Mónica, links in beeld, samen met onze vrijwilligers het traditionele Ecuadoraanse paasgerecht Fanesca.